Is your world like mine and it revolves around characters like Minnie, Ariel, Simba, and Tinkerbell? Are you looking for something to do during April vacation? Well, boy do I have something for you! 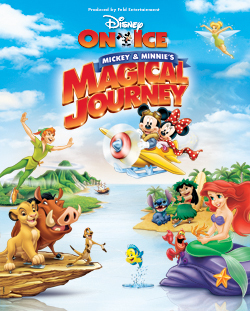 Disney on Ice: Mickey & Minnie’s Magical Journey is heading to the DCU Center in Worcester, MA April 19th to the 22nd. Sounds pretty awesome, huh? I know I can’t wait to attend with my family. What’s that? You want to attend, too? Well you might just be in luck because one Dollops reader is going to win a Family Four Pack to the show on Thursday, April 19th at 7pm. How could it get any better you ask? How about we throw in a meet and greet before the show (5:30pm) with two special characters?! I know lots of little girls and boys who would LOVE this opportunity so be sure to enter! Mandatory Entry: Leave a comment below letting me know who you would bring to the show with you if you won. Share this post on your own Facebook page (one entry). Please leave a separate comment for each entry that you do so that you get the proper credit. Already do some of the above? Thank you! Please leave a separate entry for each and tell me. Make sure that a valid email address is provided so that I can contact you if you win. Winner will be randomly selected on 4/1/12 at 8pm EST. Winner will have 48 hours to respond before a new winner is chosen. Contest is open to US Residents only. *Please note that I received no monetary compensation for this post but have received a family four pack of tickets to the show and will be attending the meet and greet.